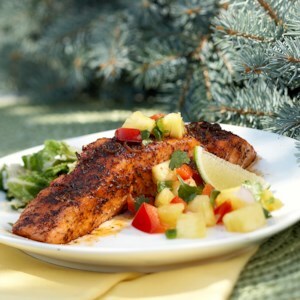 Find Healthy Delicious Low-Cholesterol Fish & Seafood Recipes, from the food and nutrition experts at EatingWell. Pesto doesn't always have to be of the Italian variety. In this dinner recipe, the pesto is Asian-inspired--full of mint, parsley, lemongrass, and ginger. 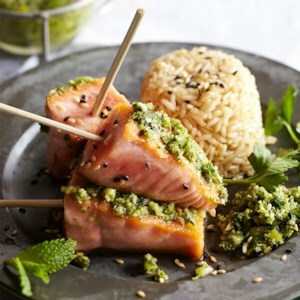 Served with wild salmon satay and brown rice, this dish will please everyone at the table. 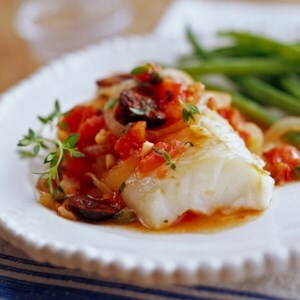 This 40-minute recipe pairs a vibrant black bean salad with baked flounder. 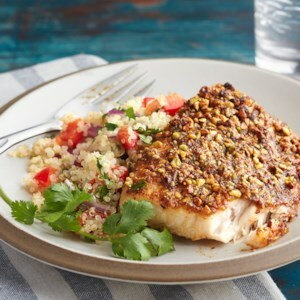 The flounder is coated in a cayenne pepper and tortilla chip crust adding a bit of heat to this Mexican-inspired meal. 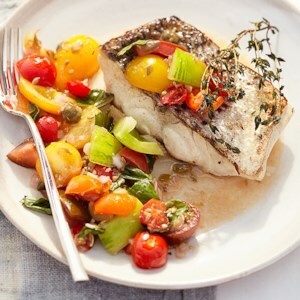 This recipe pairs a fragrant rosemary-laced eggplant and bell pepper sauce with steamed halibut steaks. 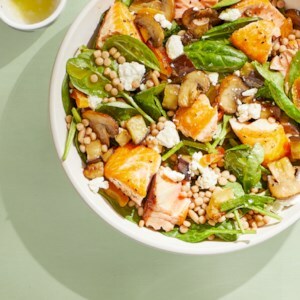 Served over a bed of fresh spinach with whole-grain baguette slices, this dinner is on the table in just 45 minutes. Put your wok to work and whip up this easy stir-fry dinner-for-two in just 20 minutes. 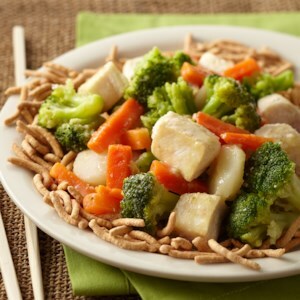 Bursting with chunks of swordfish and mixed vegetables, it tastes great served over rice or chow mein noodles. 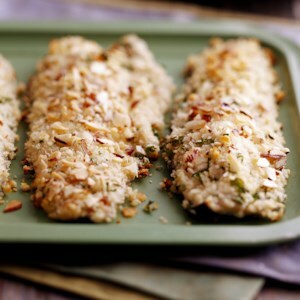 Mild tasting mahi mahi gets a spicy and nutty infusion with this crunchy chili-pistachio coating. 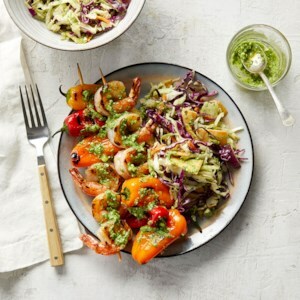 Served with a quinoa salad, this healthy meal is ready in just 45 minutes. 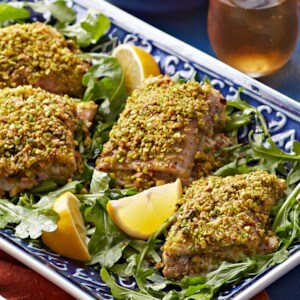 Finely chopped pistachios take center stage in this baked fish recipe. Toasted seeds are mixed with the pistachios to create a fragrant and crunchy crust which nicely compliments the tender fish. 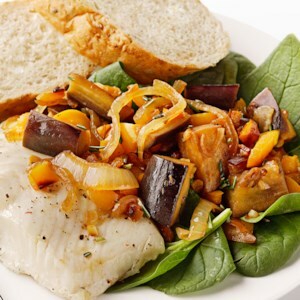 Quick-cooking fish fillets are an excellent choice for a speedy entree. Be sure to purchase skinless fillets so the coating sticks evenly. 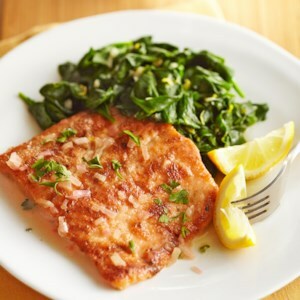 For a healthy meal, serve this lemon-glazed trout with wilted greens. Trout Amandine is a classic French dish with a crunchy almond crust that's fried in a brown butter sauce. 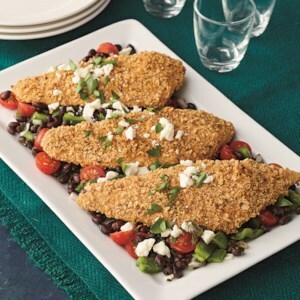 Our makeover version is baked instead of fried, and because the fillets are coated in buttermilk and breadcrumbs, you'll still enjoy a crispy and golden crust. 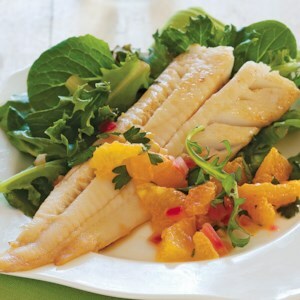 This flavorful and healthy recipe combines white fish fillets with a refreshing citrus fruit sauce. 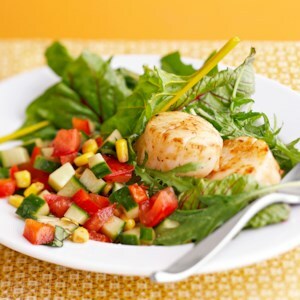 Make it a one-dish meal by serving over mixed greens, rice, or zucchini noodles. Because this one-pan meal is ready in just 35 minutes, it's a good choice for a healthy recipe after you've had a long day at the office. 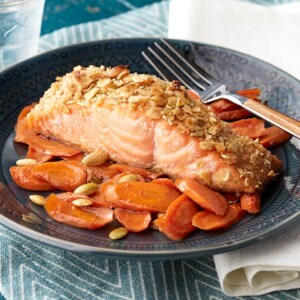 Maple-spiced carrots cook alongside pepita-crusted salmon fillets and deliver amazing taste and nutrition in a dinner the whole family will devour. Trapanese pesto is the Sicilian version of the sauce that uses tomatoes and almonds instead of pine nuts. 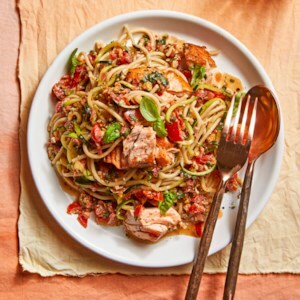 This savory pesto sauce coats low-carb zucchini noodles and heart-healthy seared salmon to create an absolutely delicious pasta dinner. 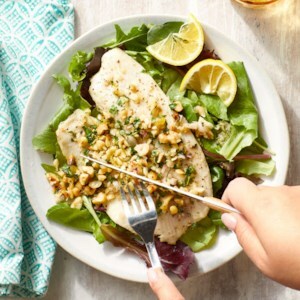 Sweet and crunchy hazelnuts team up with bright lemon and fresh parsley to add oomph to the tilapia for an easy seafood recipe. 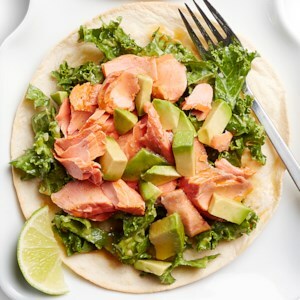 Serve this atop a salad or alongside brown rice or orzo. 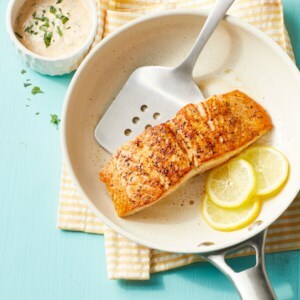 Paprika and garlic powder make a quick Cajun-inspired seasoning that flavors salmon fillets in this easy dinner recipe. Traditionally, remoulade sauce is prepared with mayonnaise; here, we substitute nonfat Greek yogurt for a lighter version.